Forge ahead without spills on early-morning rides. Sometimes water just isn't enough-that's why Camelbak reinvented the travel mug for a better on-the-go coffee and tea experience. The double-walled, vacuum-insulated steel vessel keeps 12 oz. of coffee or tea piping hot for over 4 hours, with an impact cap that prevents dents or cracks if you drop it. Forge ahead without spills on early-morning rides. 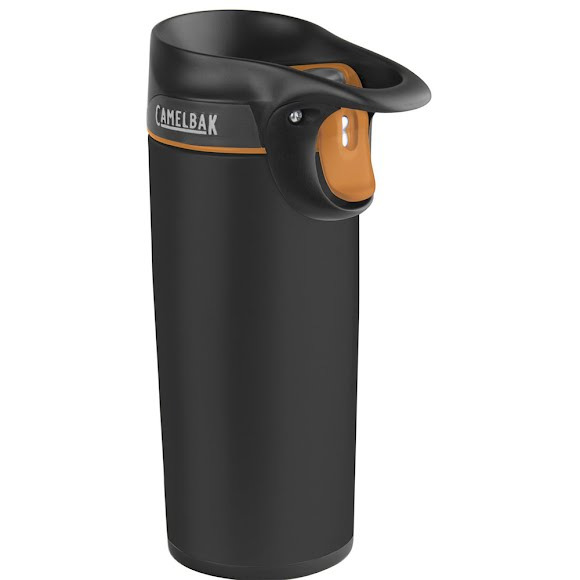 Sometimes water just isn&apos;t enough-that&apos;s why Camelbak reinvented the travel mug for a better on-the-go coffee and tea experience. The double-walled, vacuum-insulated steel vessel keeps 12 oz. of coffee or tea piping hot for over 4 hours, with an impact cap that prevents dents or cracks if you drop it. When you need to keep your eyes on the trail, the self-sealing cap lets you drink one-handed, and the smaller 12 oz. design makes it easy to toss in your pack without worrying about leaks or spills. For frequent sipping, just press the top button to lock the cap open. The cap won&apos;t collect grime, either-just pop up the arms for easy cleaning in the sink or dishwasher. CamelBak Got Your Bak Guarantee: If we built it, we&apos;ll Bak it with our lifetime guarantee.